Hi friends! In case you’re looking for some end-of-summer recipes to celebrate Labor Day or just the last beautiful, sunny, warm days of the season, I’ve rounded up 12 healthy recipes just for you. These recipes are healthy, easy, clean eating, fun, great for entertaining, and perfect for summertime. Many are vegetarian or vegan or at least have options so you can accommodate yourselves or your guests. Try these out for a potluck, BBQ, or grill-out party! Hope you enjoy this 12 Healthy Summer Recipes Round-Up. Whether you’re eating inside or having a BBQ / grill-out party outside, you’ll find some great recipes to make for summer holidays, celebrations, and festivities. Even if you’re just celebrating surviving the past week. Haha. I feel ya. 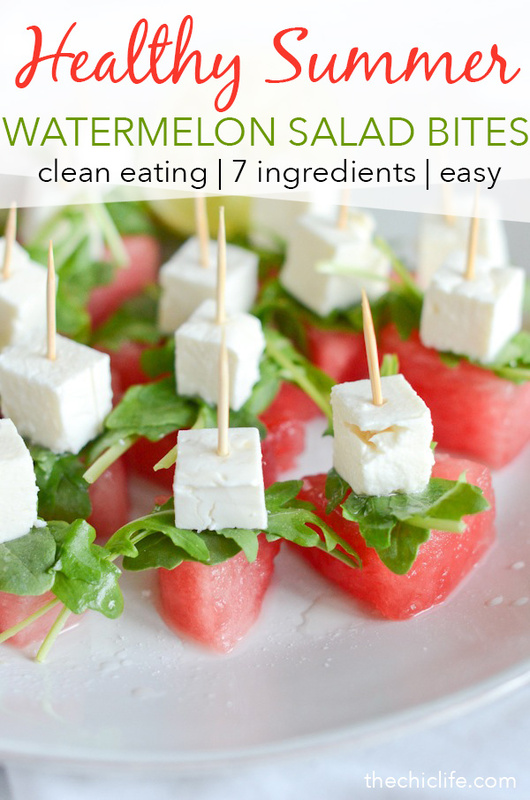 I first made these Watermelon Arugula Bites when I needed to bring a dish to a potluck party super fast. Short on time, I managed to whip these up and received a sea of “oohs” upon bringing it to the table where everyone was sitting. Yes! Low work, high reward. Nice. 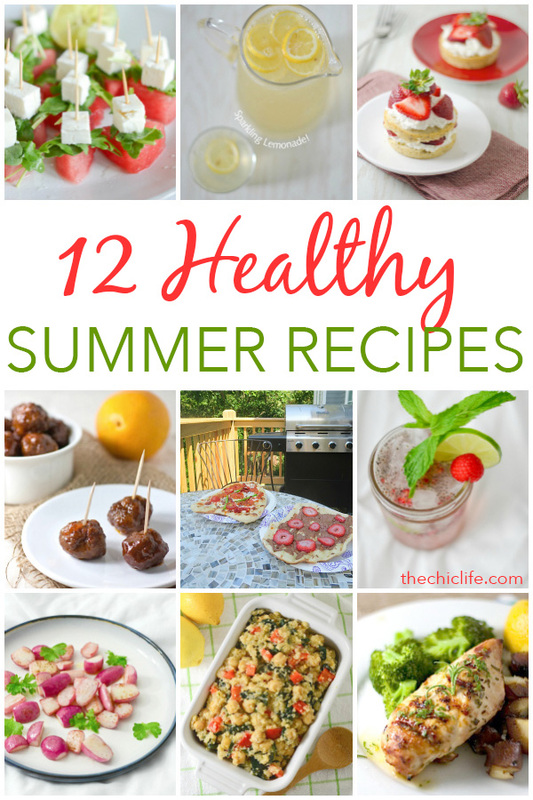 This may be my favorite of the 12 Healthy Summer Recipes! This is still one of my most popular recipes. 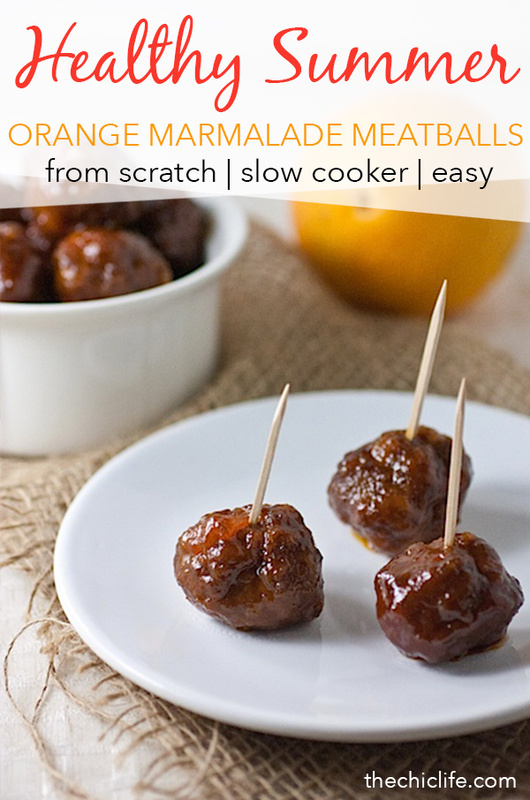 These Slow Cooker Orange Marmalade Meatballs are a nice twist on your classic potluck party meatballs with a zesty and summery orange flavor. Make your meatballs from scratch to keep this clean eating style or take a shortcut with frozen meatballs. The recipe includes instructions for both. Still have summer squash? 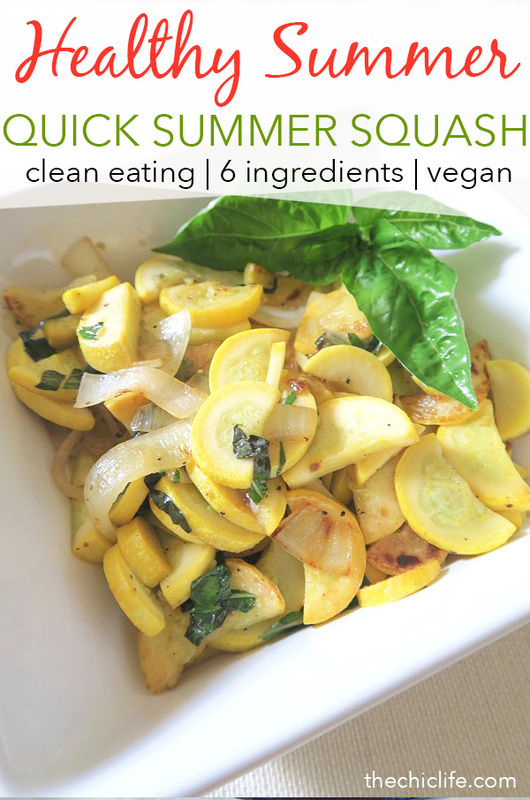 This Summer Squash Sauté recipe is a simple way to cook them with the warm weather flavor of fresh basil added. If you don’t feel like putting little toothpick bites together, here’s a similar recipe in salad form so you can toss everything in a bowl and call it a day. 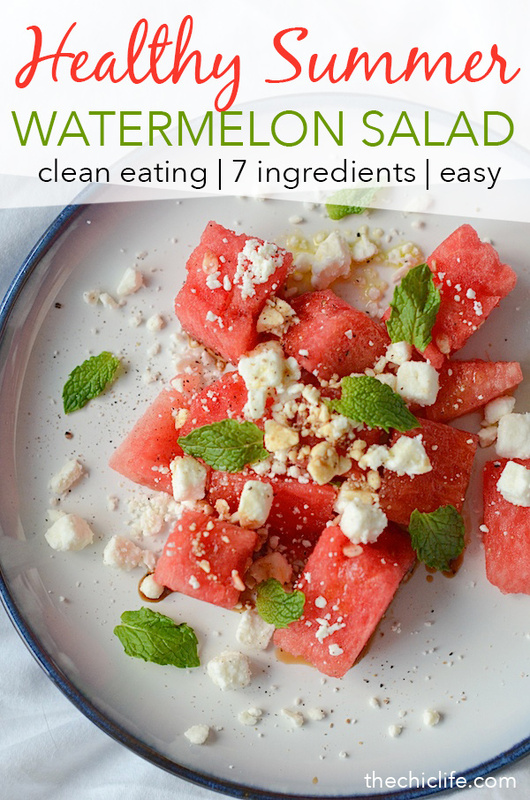 Try this Watermelon Feta Mint Salad for a simple salad that impresses with ease. 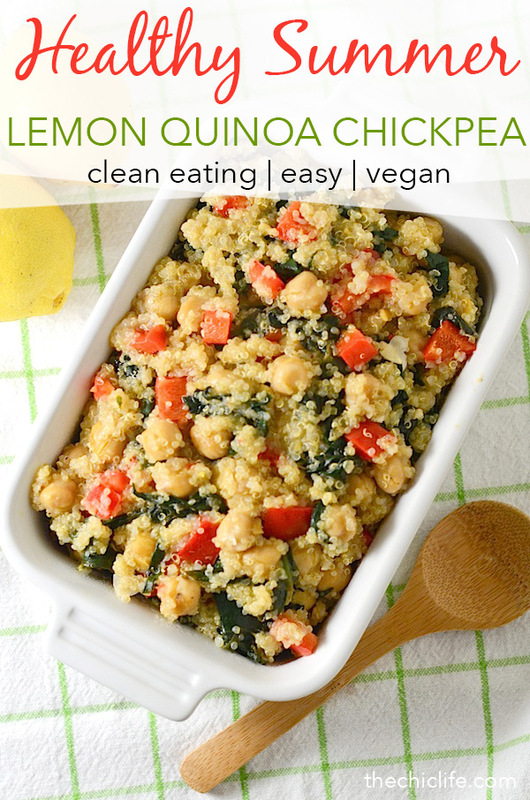 This Warm Lemon Quinoa Salad with Chickpeas is a great side dish that can also make for a vegan entrée if you’re entertaining vegan or vegetarian friends who aren’t feeling your burgers and hot dogs. Yummy food for everyone! 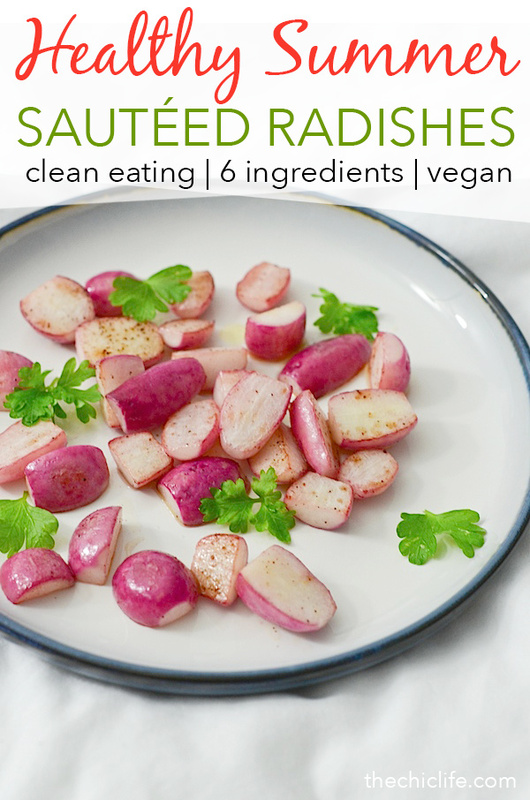 Let the veggies do the talking with this easy Sautéed Radishes recipe. The pink colors are super fun on the plate with a sprinkling of fresh, vibrant-green parsley. Don’t forget about your vegan friends. 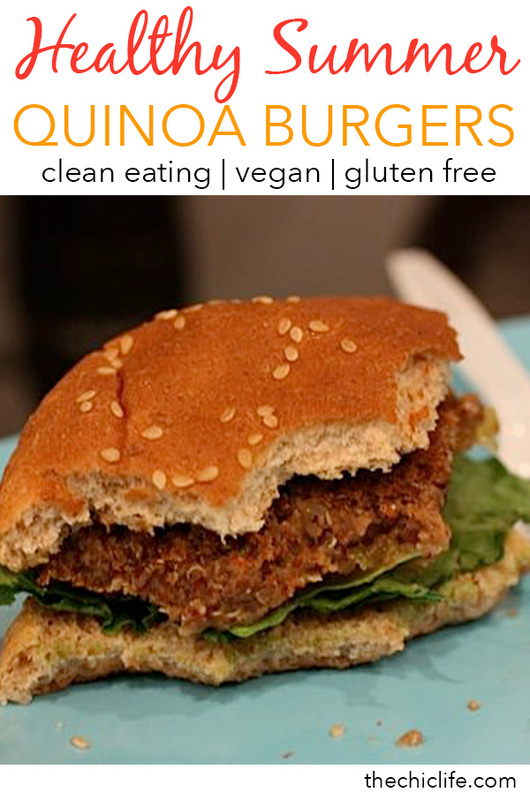 These Southwest Quinoa Burgers are super delicious. When I made these for a potluck party, my meat eating friends loved them too! Want to go uber-healthy? 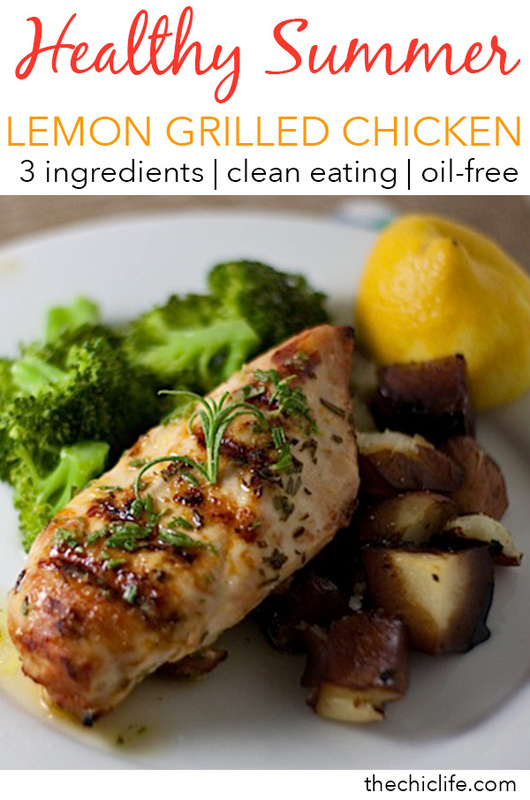 This 3 ingredient Grilled Lemon Rosemary chicken is oil-free while still having plenty of summery lemon flavor. This is probably the most fun of these 12 Healthy Summer Recipes. For an interactive and delicious way to enjoy an end-of-summer cookout, try grilled pizza! 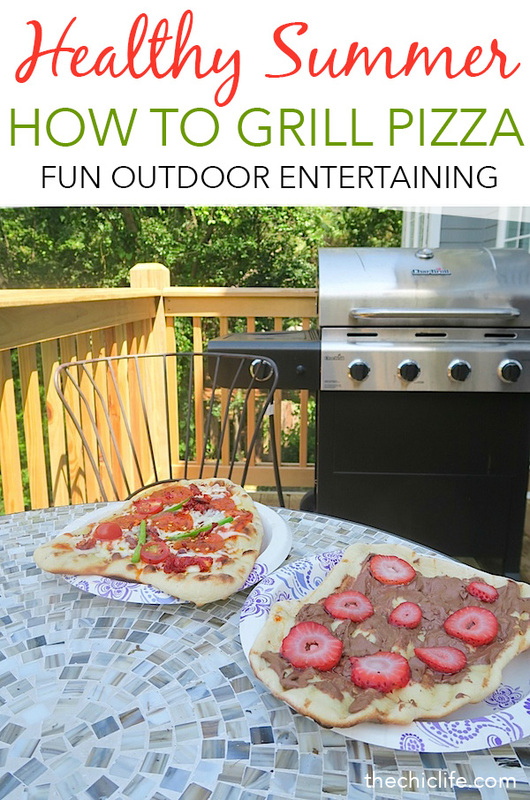 In this How to Grill Pizza post, I share tips on helping your guests customize their own pizza with their favorite toppings. With dessert pizza ideas included. Your guests will have so much fun! I couldn’t have these 12 Healthy Summer Recipes and not include a summer berry dessert. Yum! 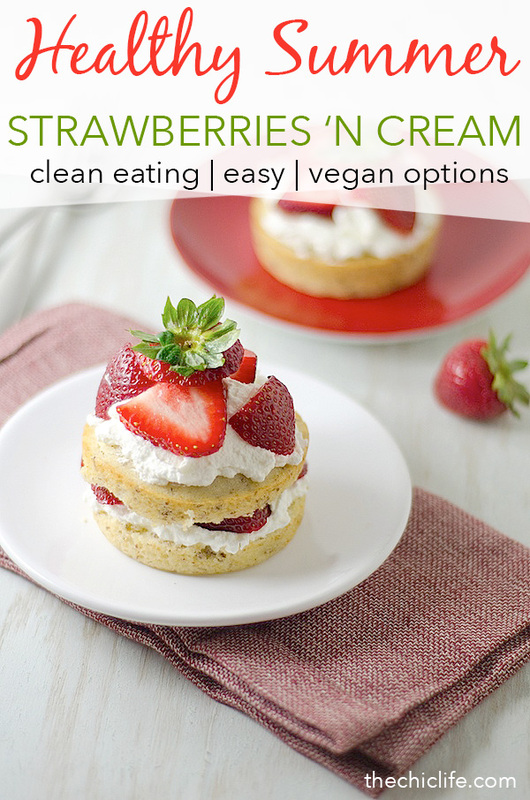 Here’s a fun take on a classic – make Strawberries ‘N Cream cakes…but individually sized! These are great if you’re entertaining for two or you just think these are super cute. I have a bunch more healthy dessert recipes here, but I thought this one went best with the theme. Skip the lemonade from concentrate or worse…powder! You can make your own lemonade with fresh lemons. It’s easy, and I’ll show you how. 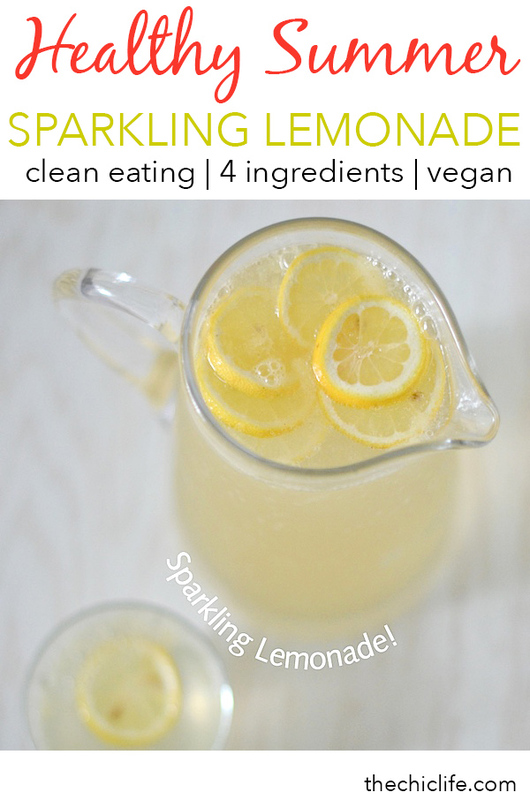 Plus you can take it up a notch by adding bubbles with this easy clean eating Sparkling Lemonade recipe. Why not offer a superfood-packed mocktail in addition to your other beverages? 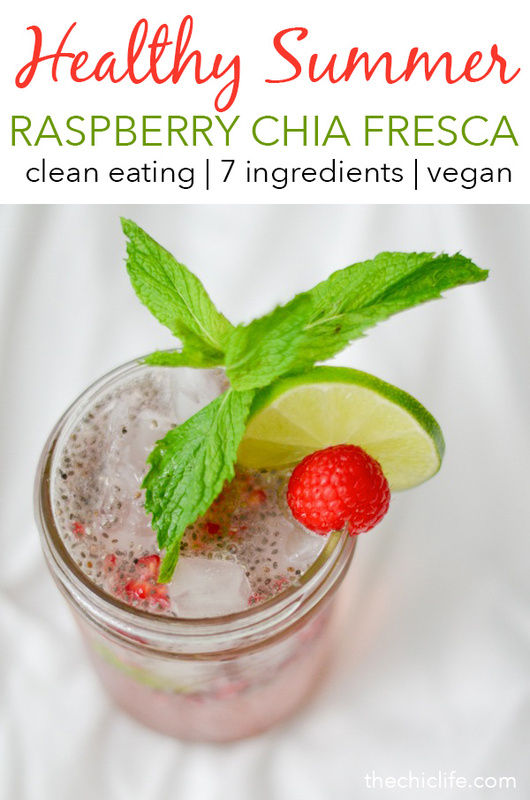 This is low in sugar and super refreshing. Blue Coconut Chia Pudding – plant-based blue coloring! Thank you for checking out this 12 Healthy Summer Recipes Round-Up. Hope you found some great recipes to try out. Enjoy your holidays and summer! I’ll be bringing out some new fall recipes very soon, so stay tuned for that. These are all pretty new, so bear with me as I build the content up. I’m finding some good stuff for you, though! AND…I’ve been pinning like crazy to my existing boards, so check those too for lots of great healthy food and lifestyle ideas, plus fashion, photography, travel, and more! Check out my Pinterest profile because there are more there too!